Here is some pics taken after the hunt. We had to take measurements and weight of the elk which had to be turned into the local Conservation Officer. A lot of people don't realize this, but Kentucky has the largest elk herd east of the Mississippi. Kentucky Bob was in on the release when he worked for the Ky Dept of Fish and Wildlife. This cow was taken about 2 miles from my house. What was the weight? How much difference is there in fat content and taste compared to deer? Some good eatin right there. I think moose and elk are the best wild meat there is. Congratulations. It field dressed out to 558 pounds. The meat is pretty lean and taste closer to beef than deer. I like deer, but the elk is better. 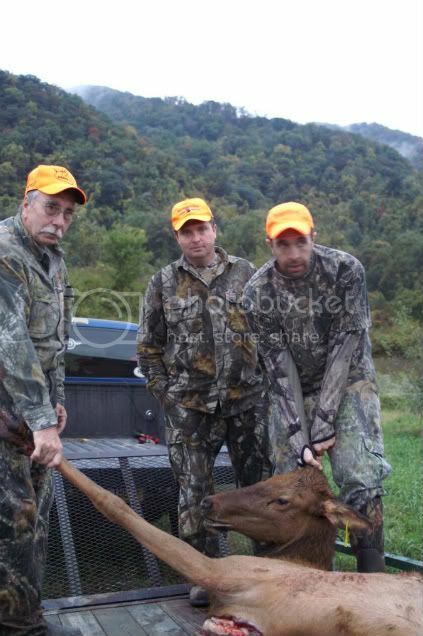 This hunt was in October ( I am very slow to post pic I guess) and we did work up a pretty good sweat trying to field dress and get it out of the woods. You dont drag an elk out of the woods like you do a deer. My father-n-law was drawn for this hunt in the spring and he had been very sick as a matter of fact the doctors had given up on him. So this was an extra special hunt for the entire family. Wow....that's a bunch of meat. Congrats on the hunt.